You’re gonna be blown away at how easy and delicious and amazing this burger recipe is. Its very easy to make and requires minimal ingredients to make. The George Foreman Grill or other indoor grills are perfect for making burgers. It’s really quick to do, the burgers don’t cook in their own grease (which of course is good), and they really do come out delicious. In a large bowl, combine ground beef, salsa and bread crumbs. Mix well. Shape ground beef into 1 equal round portions. Poke your thumb down into each beef ball about half way and fill the centers with about a tablespoon of the Monterey Jack cheese. Close up the hole by just pressing it closed and flatten in a burger patty. Preheat your indoor grill with the lid closed for at least 5 minutes. Use high setting if you have it. Place burger patties on grill and close lid. for burgers this size the approximate cooking time is 4-6 minutes. You can give the burgers a 1/4 turn halfway through cooking for crisscross grill marks and to ensure even cooking. 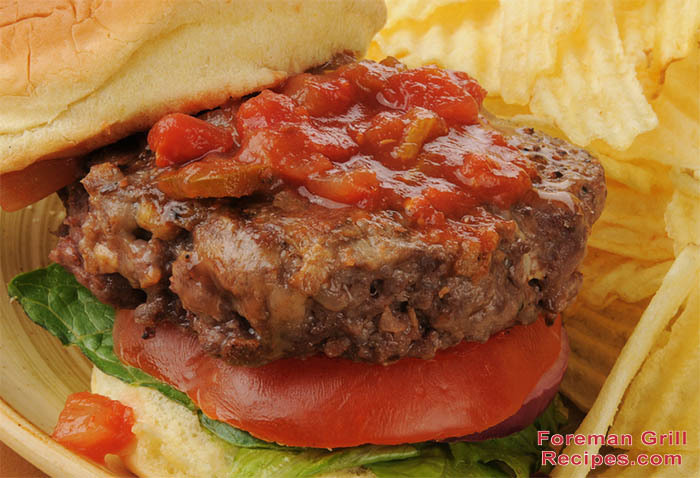 These stuffed salsa burgers are best served on a toasted bun with some fresh tomato slices and avocado. Enjoy!